A portable computer based on the MOS 6502 that aims to enhance security and privacy. This project was created on 03/22/2018 and last updated 2 months ago. Technology moves fast in today’s world, but this is not necessarily a good thing. The reliance we have on the World Wide Web and Intel CPUs is advertised by the biggest corporate marketing departments as nothing but a good thing. The fact that the biggest parts of our computer hardware, computer software, and internet functionality is provided by monopolies is glossed over, if it is mentioned at all. Here I want to address the 2018 Hackaday Prize submission criteria of “Building Hope”, and why my competition entry does build hope. The category of the competition I am entering is Open Hardware, and I want to show how my open hardware design builds hope. My open hardware entry is an internet-enabled 8-bit portable computer. I am aiming for my design to be as low cost as possible, and I want it to avoid many of the devastating problems I can see with most contemporary internet-enabled portable devices. The two main problems I want my 8-bit computer to address are (a) the devastating privacy and security problems of HTTP (the World Wide Web) as the main platform for internet connectivity; and (b) the devastating security problems of modern Intel CPUs, which can be found in the vast majority of internet-connected consumer devices today. Many modern devices are designed just to go on the web. We call low end lean terminals with operating systems based on Chrome “netbooks”. This is a terrible way to use computers, and a terrible way to use the internet. HTTP is an inefficient and insecure method of information distribution. The shift to using cloud computing in order to be productive and useful presents a scary prospect for information safety and privacy. This article (https://www.w3.org/Protocols/HTTP-NG/http-prob.html) by Simon E Spero shows that HTTP is a slow and inefficient internet protocol. Most of the time, HTTP is waiting. The slow start to HTTP connections hurts performance, and slows down the Round Trip Time (RTT). HTTP is also a highly centralised protocol. This means that all HTTP data is stored in a centralised server, and all clients must negotiate with the central server 100% of the time in order to establish connections and distribute data. First few hours of work on a conceptual flowchart of the architecture of the 8 bit laptop. This is just a quick blog post to say that I have revised my plan for this project a little. I have decided to make the computer use 32K or 48K of RAM. I have found a cheaper 4G cell breakout board than the one that I originally specified. I have also decided not to go with the Hobbytronics open source serial-to-VGA video driver, and instead use the TIA from the Atari 2600 as the video chip for the computer. The following is the implementation of the TIA in the Atari 2600, which uses the TIA to generate a composite output, which is then combined into an RF signal. And I will draw up schematics showing how I will change this circuit to display composite video and monoaural audio. The TIA is a very versatile device which is capable of 128 colours in NTSC video, with one colour per scanline. With special coding, it is possible to draw up to 36 columns of text. See THIS forum post and THIS blog post for more details. This is an example of the text display. This is 36 columns. I think it is possible to go further. Both the TIA and VIC chips are available for cheap online as new parts, and also in broken machines, so I think this is a good idea. I may experiment with the VIC from the VIC-20, to see which chip I like best. The TIA is also capable of fantastic 8-bit graphics. Just discovered this projec here: (https://hackaday.io/project/18331-mkhbc-8-rx)! This (https://hologram.io/nova/) website lead me to the ublox SARA modules. I think I&apos;ll be using a celluar data module like this one (https://www.u-blox.com/en/product/sara-u2-series) in my design. I think it will necessitate another ACIA serial chip. As far as I can tell, the ublox chips can interface via UART, and recieve AT commands. There are modules that do LTE and positioning as well. I have been trying to wrap my head around exactly how the 74LS610 Memory Management Chip will work in my Hackaday Prize competition entry. There is not a lot of complete documentation on exactly how to implement the 74LS610. So, ultimately, I decided to scrap using the chip, and I decided to use a simpler and more rough-and-ready solution to how to extend the memory of this internet-enabled 8 bit laptop I am building. The incredible benefit of this solution is that it minimises the amount of programming needed in order to switch banks of ROM and RAM. The implementation uses one half of a 74HCT139 decoder to select between the ROM and RAM. When A15 is high, RAM is selected; when A15 is low, ROM is selected. A15 is gated with /MREQ to assure that the memory chips are enabled only when the bus access is for memory, and only when the address lines are stable. As the document outlines, a 74HCT273 eight-bit latch serves as the bank switch latch. Because this circuit is intended for a Z80 processor, the circuit requires the user to output bank switch information with a Z80 OUT instruction, which would generate the output strobe /BANK. Because we are using a 6502, I imagine we could do that with the VIA. The document specifies that a 74HCT138 or similar part (not shown in this schematic) would interface with the Z80 processor to recieve an OUT opcode to generate the bank switch strobe and other needed I/O strobes. At power-on, the /RESET signal resets all the bank switches to zero. The latched bank switch output signals, BS0 through BS7, are connected to one input of each of eight 74HCT08 AND gates. The outputs of these gates are used to generate extra address lines for the ROM and RAM chips—three for the ROM, and five for the RAM. to a bank-switched memory area. As you can see, this is a very simple solution to what could be a complex problem. 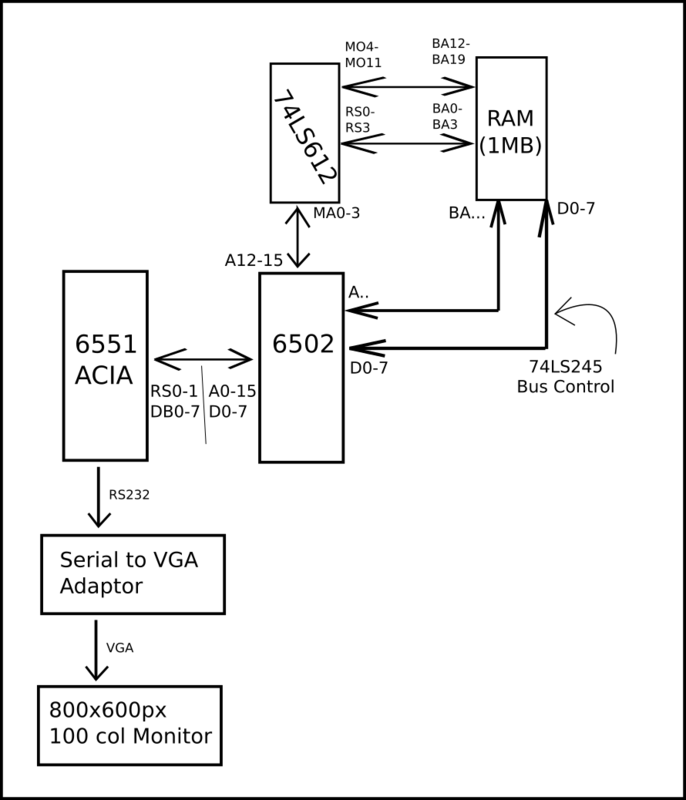 Using the VIA chip already being used in this design, and just by using A14 and A15 of the 6502, we are able to increase our total ROM addressable to 128K bytes, and RAM to 512K bytes. I think this will be sufficient. There are four areas in the memory map. The power of this design is that there are 16K bytes each of ROM and RAM which are base ROM and RAM. This means that these areas are not switched out upon switching banks, which means permament program information can be stored in these banks, which is very useful. I imagine we can section of parts of these 16K byte areas for IO. The stack can be located in the base RAM area, and the reset vectors needed for the 6502 can be located in the base ROM area. There will need to be an area in the base RAM area which shadows the state of the bank switch latch. This is so the operating system of the computer can keep track of the state of the bank switch latch. This will be useful for multi-tasking applications. Perhaps aim for 32KB or 48KB RAM. I wanted to write quite a nice operating system for the new computer, so I thought about a megabyte of RAM would be useful, and make the task easier - but wrangling the MMU gives me some grief. Perhaps it would be easier to just stick within the 2^16 memory space? Like 48KB or 32KB RAM. I&apos;ll do some more research on virtual memory spaces for 16 bit memory spaces. ROM and IO (through the 6522 VIA) is not that difficult. I need to find something to decode the address logic though - but that shouldn&apos;t be too difficult. I pirated this academic article - check out some of the diagrams from it. If you&apos;d like a copy of the article I&apos;d be more than happy to provide it. Here&apos;s my firs couple of hours making a simple conceptual flowchart for the architecture of the 8-Bit Portable Computer. I don&apos;t have the protection circuitry for the 74LS612 MMU finished, so I didn&apos;t want to go into a complete electrical schematic. I anticipate that I may need a second 6522 ACIA in order to debug the system. At the moment, most of the components for the computer are remaining very cheap, so I am hoping this may be able to be copied and built elsewhere. We need this project. I am very interrested to see how this turns out. Best of luck, good sir! You are about to report the project "8-Bit Portable Internet-Enabled Computer", please tell us the reason.